Researchers at the Melbourne’s Walter and Eliza Hall Institute announced yesterday that they discovered that breast stem cells and their ‘daughters’ have a much longer lifespan than previously thought, and are active in puberty and throughout life. The longevity of breast stem cells and their daughters means that they could retain genetic defects or damage that evolves to cancer decades later, potentially shifting back the timeline of breast cancer development. The finding is also integral to identifying the ‘cells of origin’ of breast cancer and the ongoing quest to develop new treatments and diagnostics for breast cancer. 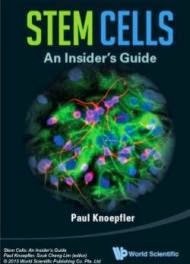 Breast stem cells were isolated in 2006 by Professor Jane Visvader and Professor Geoff Lindeman and their colleagues from the ACRF Stem Cells and Cancer division at the Walter and Eliza Hall Institute. Now, in a research led by Dr Anne Rios and Dr Nai Yang Fu that tracked normal breast stem cells and their development the team has discovered that breast stem cells actively maintain breast tissue for most of the life of the individual and contribute to all major stages of breast development. The study was published in the journal Nature. Prof. Lindeman, who is also an oncologist at The Royal Melbourne Hospital, said discovering the long lifespan and programming of breast stem cells would have implications for identifying the cells of origin of breast cancers. "Given that these stem cells – and their ‘daughter’ progenitor cells – can live for such a long time and are capable of self renewing, damage to their genetic code could lead to breast cancer 10 or 20 years later. This finding has important applications for our understanding of breast cancer. We hope that it will lead to the development of new treatment and diagnostic strategies in the clinic to help women with breast cancer in the future." said Prof. Lindeman. Prof. Visvader said understanding the hierarchy and development of breast cells was critical to identifying the cells that give rise to breast cancer, and how and why these cells become cancerous. "Without knowing the precise cell types in which breast cancer originates, we will continue to struggle in our efforts to develop new diagnostics and treatments for breast cancer, or developing preventive strategies.” said Prof. Visvader. Previous research from the institute team had already implicated some of these immature breast cells in cancer development. "In 2009, we showed that luminal progenitor cells, the daughters of breast stem cells, were the likely cell of origin for the aggressive BRCA1-associated basal breast cancers. The meticulous work of Anne and Nai Yang, using state-of-the-art three-dimensional imaging, has significantly improved our understanding of normal breast development and will have future applications for breast cancer." said Visvader. The project should settle a debate that has been raging in the scientific field, confirming that breast stem cells were ‘true’ stem cells capable of renewing themselves and making all the cells of the mammary gland. 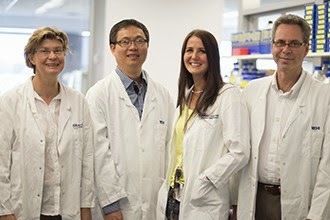 Professor Jane Visvader, Dr Nai Yang Fu, Dr Anne Rios and Professor Geoff Lindeman (left to right) said Visvader. The research was supported by the Australian National Health and Medical Research Council, Victorian Government, Australian Cancer Research Foundation, Qualtrough Research Fund, National Breast Cancer Foundation and Cure Cancer Australia.